UPDATE: Our loving little Hercules became very sick due to kidney failure, other health issues and just old age. After fighting mightily he finally went to doggie heaven on December 6, 2018 after 14 years and 9 months of giving all the love he had to us and to anyone he came into contact with. Words cannot express our feelings but he will be fondly remembered and badly missed. Goodbye Herc. Rest in peace my little buddy. 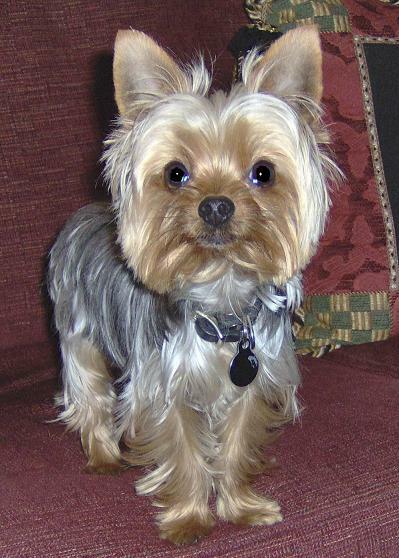 Hercules is our Yorkshire Terrier (Yorkie) pet. He was born on March 16, 2004. We adopted him from a hobbyist breeder on June 12, 2004. 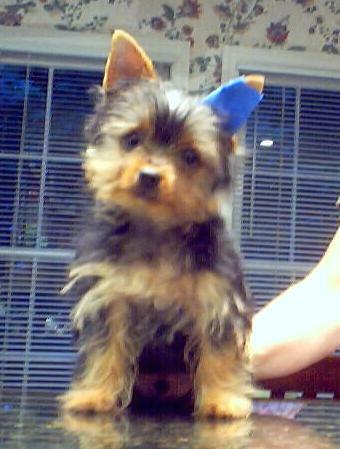 We met Hercules's mom, dad and 3 sisters and they were all beautiful and healthy Yorkies too. Hercules is all male, weighed 3.05 pounds and at 4 years 6 months old (when the right photo was taken) and will not be getting much larger. Hercules may be little but he doesn't know that. He thinks he is a big dog and handles himself accordingly around other much larger dogs. He doesn't let any of them mess with him! He is however very affectionate, playful, very calm, VERY lovable, housebroken, gets along beautiful with all humans, especially children, and is just one of the family. Hercules is 7 years old now as of this writing. He has gained a little weight to a whopping 3.5 pounds. His upper lip, mustache area and back have turned silver-gray over time. Otherwise he looks (and acts) just the same as always. The blue colored stuff on his ear in the left photo was simply masking tape, used to hold up a flopping puppy ear, at the advice of the breeder. As you can see in the newer photo on the right, the ear stands up just fine now on its own. We were worried for nothing. He's absolutely perfect, a gift of love. He has brought us so much happiness. We love Hercules very much.